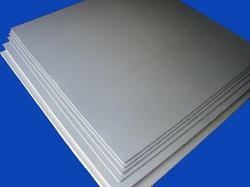 Exporter of a wide range of products which include asbestos mill board. We are among the celebrated names in the industry for supplying and trading Asbestos Mill Board to our revered patrons. The offered millboard is used in a gamut of thermal insulation applications and offers ultimate solutions. It is dimensionally precise, resistant to chemicals, durable and thermally stable over a wide range of temperatures. Looking for Asbestos Mill Board ?